What do You do with Your Summer? Summer is HERE!!! Woohoo! Praise the Lord and hallelujah! …so what are you doing? Below are some ideas and some things that I have done to make the best of my summer, because they go by quick! What a great time to strip wallpaper off the walls or tackle a garden or make that miniature dollhouse that you have always dreamed of making…or whatever it is that you feel the need to do. :) You’ve got 2+ months to do whatever you feel like you need to do! Just don’t over extend yourself! You don’t want to have no running water and a half finished bathroom at the beginning of the school year (I may or may not be speaking from experience…)! This is personally my least favorite option for a summer activity, unless you count this blog and my digital arts curriculum that I have developed as a job. Summer can be a great time to tuck away a few extra bucks for savings or to pay off the dreaded school loans that most people leave school with. The best thing about teaching is that you get the same vacations as your kids. Although some may not count that a blessing, sometimes the hardest kids to teach are your own (can I hear an amen?). My summers are filled with play dates, zoo trips, swimming lessons and more! Of course, I also make time to go to the gym and leave them in the kids zone so that I can have some me-time. I DEFINITELY leave them in there for the full 2 hours most days. Don’t judge! Whatever you decide to do, make sure that you choose something that you enjoy and something that fills you up! You want to feel like the “best you” when you return to school in the fall! What are your plans for the summer? Comment below! Read more about What do You do with Your Summer? Teaching isn’t for everyone. There, I said it. It’s out there. This blog post isn’t going to try to convince you to pursue a career that will not fulfill your purpose and make you hate your life. That being said, there is certainly something to be said for giving teaching another chance. Year one is often the tough both physically and emotionally (as it was for me), but I am very glad that I stuck it out and gave it another year. Year two is radically better than year one. I cannot express the difference that a year of experience can make on your attitude toward teaching. The summer after my first year really was rejuvenating. I did absolutely NO SCHOOLWORK for the first month of the summer. I thought briefly about getting a summer job…but instead I read books, worked around my house, and sat on my couch watching Netflix. After my couch potato month was finished, I was finally ready to start thinking about the coming school year. I kept it relaxed. I didn’t obsess over details, I planned out the year loosely, knowing that every class dynamic is different and I couldn’t expect things to be the same year after year. Prepare for the next year when you are ready. If that is after one month of the summer is gone, so be it. If it is after 2 months, great! Just be ready to put in the time needed whenever you decide to do it. I know that this may seem oxymoronic…but sometimes the obvious advice is the best advice! Are there any seasoned teachers out there who could offer more advice for making the best of your summer? Comment below! There were certainly low spots in that first year of teaching. As I reflect back on that first year it is hard for me to remember the good times because they are so overshadowed by the bad. It always seems to happen that way. For this blog post, I want to reflect on that first year as a whole and talk about a few things I wish I would have done differently. First of all, I wish that I would have kept a journal. For many reasons, but mostly so that I could look back at the year with fresh eyes and better remember what that year was to me. According to that chart that I shared last week, the spring should have been a rejuvenating time. I am not exactly sure that it was, I hardly remember the second half of that first year. I remember that I did not stay after school until 6 pm every day (the way I did the first semester). I remember that I was staying pretty much one day ahead of my students in most of my classes. (I would learn something one day and then teach it the next day. This resulted in varying levels of success.) And I remember that I was really looking forward to summer. I am not sure that I looked forward to something quite so eagerly in all my life. I just wanted out. I wanted a break. It had been the most trying 9 months of my life, and I am not too proud to admit it. The second thing I wish I would have done is ask for or get more some help! I wish I would have gone back to my college buddies and asked them what I should have done in specific situations or purchased some online curriculum to use in my classroom. TeachersPayTeachers.com is an excellent place to find curriculum. You can find full curriculum or just single lessons. There are also many art teachers who have created their own websites and sell their lessons that way. This website is such a website. I sell digital art lessons (both graphic design and digital photography). You can go to this link to find out more! The last thing I wish I would have done differently is to just be more myself. I was so concerned with trying to be right all the time that I did not allow the students to see the real me. I was not honest with them when I didn’t know something (these days I am only too happy to say, “Hmmm, I don’t know the answer to that question, why don’t you go ask google!”). That was a mistake because if students don’t know you, they can’t share in your life and you can’t invest in them nearly as well. Keep a journal - so that you can remember how you felt and what you did. Ask for help - where you feel the need. You don’t have to do this on your own! Be yourself! - Students will trust you more and you will have more fun if you don’t pretend to be perfect! Can anyone related to my words? Comment below! If you have been reading my posts thus far, I hardly need to tell you that my first semester was no cake-walk...it was a bit more like running the gauntlet. Everywhere I turned I felt like I was being pushed down. So when Christmas break rolled around and people would ask how my first year on the job was going, I would answer with a solitary word: “Fine.” There must have been some kind of finality in my voice, because nobody ever asked for more information. I didn’t want to talk about the reality of my experience thus far. I didn’t want to talk about my frustrations with the lack of motivated students. Nor the fact that I felt completely unprepared and was continuously running behind. I didn’t want to talk about the fact that my technology was continuously failing me. I didn’t really want to talk about anything. I felt numb. How could I return to work feeling this way? 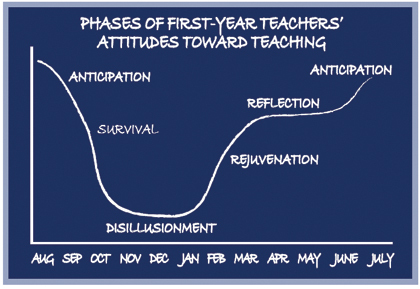 It was at this time that I discovered this graphic explaining the phases of the first year teacher’s attitude toward teaching. Which can be found at this website. http://weac.org/articles/new-teacher-handbook/phases/) It was alarmingly true. I certainly did start the year with great anticipation and by September I had defiantly entered survival mode. And now, the disillusionment had unquestionably set in. I took some solace in the fact that things were going to get better...at least according to the study. If you are feeling a bit like I was that first Christmas break, here is my advice for you: don’t do work. At least for part of your time off. If it is Christmas break, decide that you won’t take work home, won’t even look up lesson plan possibilities on Pinterest. I had 2 weeks of Christmas break and I think that I actually worked on school prep for 2 days of that time. If you’re with family, be with family. If you have some time to yourself, go get a pedicure! Or whatever it is that de-stresses you! If you are anything like me, your mind is probably completely weighed down with all the worries and stresses of the year thus far. No matter what time of year it is, don’t forget to take care of yourself! If you don’t you won’t feel your best when you get back to school and you won’t want to deal with all the crap that gets thrown your way. Are there any seasoned teachers out there who can relate to these feelings? What is it that you do to destress and unwind? Leave a comment and share your mind. My blog posts lately seem to be somewhat on the negative side lately… I thought I might lighten the mood a bit by describing some sparks of hope in that first semester that helped me remember the reason why I went into teaching in the first place. I remember a day just before Thanksgiving. Volleyball had just finished up (Did I mention that I also coached volleyball that first year? Busy busy! ), so I had a moment to breathe before the end of semester. Awwww, I think I lived on those words for a solid week! It is so gratifying when you actually get proof that what you are doing is making a difference! We don’t often get these little nuggets when we need them. And I need to remember them when things get tough! My worst day needs a little context: about a week before this unexpectedly terrible day, I was doing a “Frosting Color Wheel” with the intro class. I know that it seems a little juvenile, but kids of all ages love frosting and cookies! Anyway, I started the project by handing out Nilla Wafers and little cups of frosting. Then one of my paras who was with one of my functional special education students pulls me aside and asked me if I had anything alternate for her student since she had a condition that restricts her diet, so I pulled out some colored pencils and had her draw a color wheel and color it in on that paper. So the main portion of the students were mixing frosting colors and eating cookies while she colored here color wheel. No problem! Nobody complained and it seemed like a perfectly fine class period. Well…apparently, she (the student) had a bit of a break down after school in the middle of the street and wouldn’t even get into her mom’s car. She had a lot of pent up anger and energy! About a week later, I am summoned to go to a meeting that took my whole plan period and a little of my lunch time in which they had a specialist from New York talking to me and her other teachers about the necessity to NOT have food of any kind in the classroom. My art project was brought up several times and I was on the verge of tears by the time I left the room. When I finally was released, I rushed as fast as I could to my room, picked up my bike and started for home (I lived close enough to bike, an excellent perk for working in a small town). I was riding as fast as I could so that I could scarf something down before I had to go back to school again. But before I got home, I got stopped by a cop. "Can I help you?" I said. He may have said more, I can’t remember. I think I mumbled an “Okay,” and then went inside to cry through my lunch period. The worst part of it all was, I had to go back to school, AND go to volleyball practice after that! Wow! It takes a lot longer to go through a bad day than it does a good day…I guess details are just still very vivid. But like I said, it is comical now. I mean, where but a small town would you get stopped on your bike by a cop! Do you have any inspirational first year stories you’d be willing to share? Or can you top my no good, terrible, very bad, day? Leave me a comment! I’d love to hear them! I have spoken about my graphic design and digital photography classes in previous posts, in this post I want to give you a full picture of what the rest of classes looked like in those first few weeks (because I taught MANY classes). These were the classes that I felt most confident in. I actually had them make a sketchbook and started weekly sketchbook assignments on top of the projects I had them doing. I had them sketching out complex concepts and techniques that would correlate to their projects…but that kind of backfired on me. The sketchbook was not something that they were used to, so when I came in and told them that they had to do one every single week…it went about as well as asking a chicken to sneak through a bubble wrap covered cornfield. I think I also had higher expectations than the previous teacher; raising expectations will always come with pushback. I asked my advanced class to fill out a project proposal to explain what they wanted to do for each of the 5 projects that they wanted to complete that semester. Between that and the sketchbook, you would have thought that I was asking them to run a marathon! Ah, and then there was yearbook. I’m not sure that anything stretched me more in that first year than my yearbook class did. It was completely beyond me. I had never worked on a yearbook in my life. Ever. I really had no idea where to start, and while our Jostens rep was incredibly kind and helpful, it always just seemed like too much. I wanted to do it right, but I didn’t know how to go about it. The kids didn’t help, they were mostly concerned about making it look pretty and making sure that their pictures (of themselves) looked good. *sigh* Looking back at that class makes me grimace! So that’s all my classes and the overall feeling of that first month or so of school. I was barely treading water, but treading I was. I felt like I was constantly getting dunked and gasping for air, but I was surviving. Sometimes, unfortunately, that is the best you can hope for. A very understanding, listening husband. If you don’t have friends or family that you can reach out to, reach out somehow and find some. Even if it happens to be virtual. There are several Facebook groups geared toward art teachers that can empathize, offer advice, and “be there” for you when you feel particularly overwhelmed. Prayer. Seriously, some days it was all I could do. Chocolate. Lot’s of chocolate. I am surprised that I didn’t gain 20 pounds in that first month alone! Reminding myself of why I was in this in the first place: I love art! I love inspiring creativity in others! I love to teach people how to do art! Don’t forget that crucial point! Does anyone have anything to add? Do you have any stories of that first year that you don’t mind sharing? In my last post, I talked about my experience with graphic design in that first month of school. In this post, I will talk about how my digital photography class threw me for a loop. Luckily, I actually did know how to take a quality picture, I had grown up doing photography for 4-H and knew a couple things about composition at least. However, I quickly learned that knowing how to take pictures didn’t mean that I knew the best way to teach someone to take pictures! There was also the fact that this class also used Photoshop…which I knew nothing about. So now, I am trying to teach kids how to use their cameras, how to take a quality picture and how to use Photoshop…AND for some reason, students really didn't want to take pictures for their photography class (I really don’t understand this). Even today I have some students who simply do not take pictures for me. (You are in a photography class for crying out loud! Does anyone else have problems with this?) Weird. Anyway, my one saving grace in this class was my very first project. I decided to do something experimental called the “camera in a room”. Here is a link to the lesson I created and here is a link to an example of it on YouTube. It went off really well and the kids truly did enjoy it. After that, things kind of went downhill. I mentioned my difficulties with the computers in the last post, but it wasn’t just that, it was also that I just couldn’t get kids to take pictures, I couldn’t understand it! Looking back now, I think it was partly lack of motivation on that (there will always be lack of motivation when it comes to high school students), and partly my inability to explain what I was expecting from them. It was just a huge circle of confusion that I am not sure was ever broken…those poor students in that first year …well, let’s just say that things have improved exponentially since then- for all parties involved! If you want to check out my digital photography lessons, here is a link to the library. Again, browse the videos for free! I already briefly went over my first day of school, but I wanted to talk about the first month or so some of the specific classes that I taught. I already briefly went over my first day of school, but I wanted to come back to it again and discuss some of the specific classes. Looking back on this has really shown me how much I have grown and learned in the past 7 years. It has really been an enlightening experience for me. With nearly every class I taught, I would play the "what if" game. (ok, the last one is fictitious, but you get the idea.) I let my mind wander to great lengths before reeled myself back in and took a deep breath. Let’s talk about Graphic Design first. I was way over my head on this one! Not only did I not have any experience with the Adobe suite (Photoshop, Illustrator, InDesign, etc. ), but the last graphic design class that I had taken was in my 1st year of college and it was mostly done on paper, not computer! I mentioned in my last post that my computers started to go on the fritz after just that 2nd day. I was having lag issues, I wasn’t able to make some of the functions work in the same way as I could on my teacher computer, and I had not one but 2 classes of graphic design that first year. I even had an advanced class in graphic design that I felt completely inadequate to teach. They knew more about the programs that I did and they didn’t mind telling me so! They did not, however, know much about graphic design. I think last year’s teacher just let them play around on Photoshop and pretty much left them alone. During that first month, I would spend every evening trying to figure out what in the world I could teach and learn how to do it myself, and during the day I bumbled through trying to teach them what I had learned and run around like a chicken with my head cut off to try to troubleshoot and make sure that the whole class had learned the concept before I moved on. Not an excellent existence, I assure you. I certainly felt confused and defeated, and if this sounds like you, too, feel free to check out my library of lessons (browse the videos for each lesson for free). If you like them, go ahead and sign up for the free resources below. There is no obligation to buy from me, just check it out and see if it is right for you. There are bumps and bruises to be expected along the way for all careers. If it wasn’t a challenge, then it wouldn’t be worth pursuing! As I entered the summer before my first year teaching, I was excited and I thought that I was prepared. My schedule was full; I would be teaching graphic design 1 and 2, digital photography, Art 1, 2, and 3, and yearbook. Writing it all out like that sounds overwhelming, but by the end of the summer, I had done some research and made some plans for the first month or two of class and I felt relatively confident. The first day of school arrived sooner than I would have liked, but as I said, I felt fairly confident in what I was doing. After day one, I was doing ok (that was mostly going over the syllabus, after all). After day two, I knew that more than half of the plans that I had made for that first month needed to be scrapped. My first digital photography lesson was pretty much finished; I had planned a week for it. My first graphic design lesson didn’t even get off the ground because half of the computers were not working and I couldn’t teach my lesson due to troubleshooting issues. And yearbook, well, to say that it didn’t start off well is an understatement. The yearbook from the previous year was basically a scrapbook with mediocre pictures. I had hoped to change things for the better, but it was going to be a long road as I was already meeting resistance. My art classes went well enough, but I was pretty stressed due to all the other craziness of the day. The truth was, nothing could have prepared me for what lay ahead. Not only had I never even heard of Adobe Illustrator, but I had never been in yearbook class or worked on a yearbook before. The most I had ever done with yearbooks is flip through the index of my own high school yearbooks to see what page I was on, glance at the pictures, and then flip to the back with a pen for my friends to sign. Your experience may be different, but two and a half months was not enough for me to prepare for that first year of school. I probably could have had 365 days to prepare and I am not sure that it would have been enough. There was simply too much to learn, and most of it, unfortunately, needed to be learned through experience. Perhaps this doesn’t sound like a very encouraging post for those of you just starting out, but fear not! I will not leave you hanging! Below is a list of MUST DO’s when preparing for that first day/week of school. Some are things that I wish I had done, some are things that I am glad I did do. Breathe! If ever you feel stressed or overwhelmed about the coming of the first day of school, just step out of planning/lesson creating and take a walk, have a drink, make some art, or whatever else you do to relax and come back to your work after an hour or a day. Remember: this is why you went to school and you will be awesome! Don't forget to check out my free resources here, and if you are a veteran, I'd love it if you would share your experience from your first days of school! If you are just starting out and have some questions, I'd love to answer some for you! I want to back up a little this semester and talk a bit about my first years of teaching to encourage those of you who might be in that situation currently and provide a little nostalgia for my veteran teachers! I’d like to roll the clock WAY back for you, let me take you before my art teaching career, to the beginning of my journey. I always knew that I would be doing something in the arts after high school. I thought about being an actress, then a vocalist, finally finding true passion in the arts. I have always valued creativity and I love the way that art can allow people to release and create something that they maybe didn’t think they could previously do. Thus, my clear choice was art education. Toward the end of my college career, I entered the completely foreign land of job searching! I got the suit (and/or borrowed one from my sister) and started sending out my resume. I interviewed at every possible opening that spring. It didn’t matter if it was somewhere I specifically wanted to teach; every interview was an opportunity to get some experience. Maybe it has not been your experience, but I found that art teaching jobs were few and far between, although, there were some jobs that stayed open for a while due to the fact that the school was located in the middle of nowhere…which was undesirable, to say the least. I finally did get a position after about a month and a half of searching at a small 3A school about 30 minutes south of where I was living. I was really excited, even if it wasn’t exactly what I was looking for, I’ve really enjoyed working there for the past 7 years. Be professional. I know that this is one that they always say, but it really makes a difference. Not only in the eyes of your potential employer, but also for you. If you feel the part, you will be more likely to act the part. Map out how to get there at least the day before. Not just the location on the map, but also which door and room that you need to meet at. I was almost late to my first interview because I didn’t know which building in which I was to be interviewed. I wandered around the wrong school for about 10 minutes before someone found me and helped me! I felt so silly! Know your strengths and come with visuals. I put together a little portfolio not only with my artwork, but also with student artwork that I had compiled from my student teaching. Lastly, be yourself! They want to know who they will be working with for the upcoming year, make sure that you don’t promise things that you can’t perform on or pretend that you are more or less than you are. Be truthful, but be confident. I am sure that my list is not the most professional of lists that are available, but these are the things that I believe landed me my first position in teaching and I hope that you find them helpful! Stay tuned for my next installment next week when I talk about how I prepared for that first year of teaching. I’ll discuss some dos and don’ts and what I learned along the way. If you found this post helpful, leave a comment below, I would love to answer any questions that you have or even hear some of our stories (horror or success) when it comes to interviewing for a teaching position.